Y pod is a tree house that mounts an oak tree 12 to 20 m above the ground, it provides a panoramic view through the leaves having two main transparent facades. The tree house concept is reminiscent of childhood dreams and imagination, it’s inspired from many forms found in nature – the lizard / the snake and even a rock, it also looks like a tree fort provides an outlook and offers refuge. 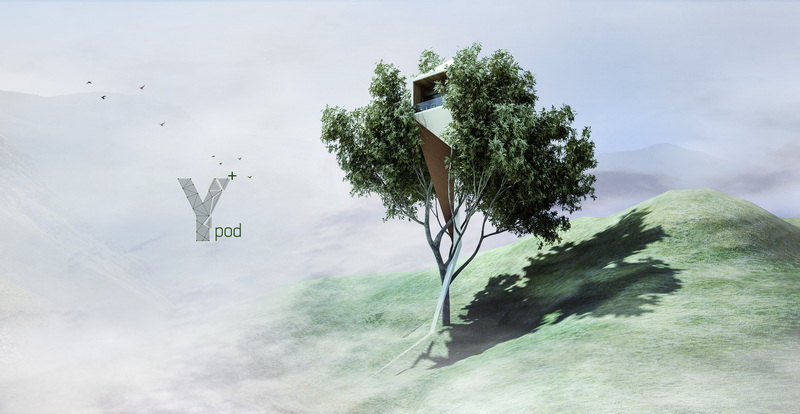 The pod consists of two parts: the main volume, a distorted cube that mounts the tree crown lying on the main branches, while the tail mounts minor branches until it reaches the ground. The access to the pod is via 20 m tree-top accessible ladder – an adventure itself. The main volume consists of a rest area and an overlooking balcony. The tail consists of a bath a kitchenette and technical zone (power bank, water tank and a sewage refinement system). It is designed to be weather resistant using acrylic sheets fixed to the roof which beside the rain water harvesting system holds photo-voltaic panels that provide the pod with needed energy.